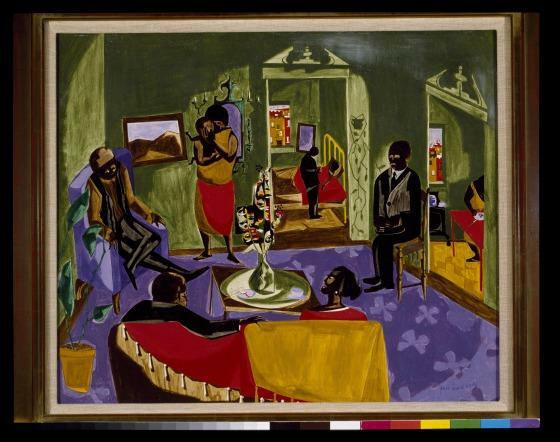 Growing up in Harlem during its fabled Renaissance, Jacob Lawrence came of age surrounded by the cultural richness of this vibrant African American community. In addition to his series on Harriet Tubman and Frederick Douglass, Lawrence worked on individual paintings that together form a loose confederation of scenes chronicling his life in Harlem. These works resonate with a power that is enhanced by the artist's manipulation of perspective and daring juxtaposition of colors. In The Visitors, a minister confers a final blessing on a bedridden person while family and friends assemble to pay their respects and offer consolation. The angular walls convey the anxiety of the gathered family; the vivid purple next to olive green sets up an uneasy vibration of color, adding to the poignancy of the moment. 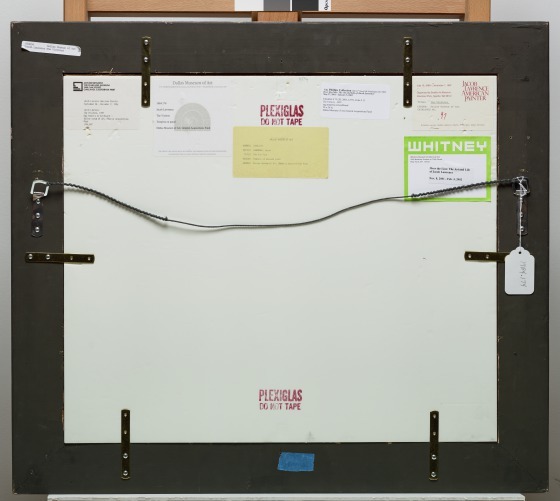 Bonnie Pitman, ed., Dallas Museum of Art: A Guide to the Collection (New Haven, CT: Yale University Press, 2012), 284. 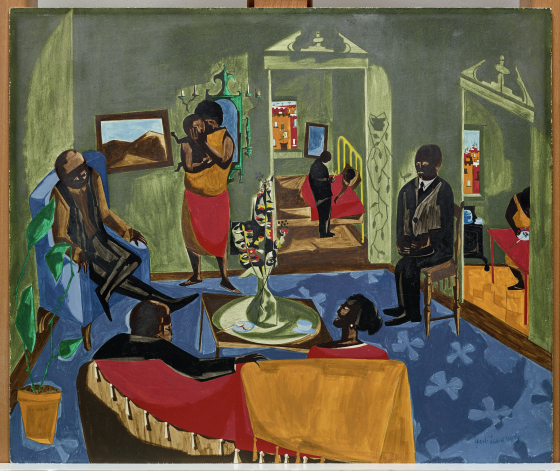 Eleanor Jones Harvey, "Jacob Lawrence, The Visitors," in Dallas Museum of Art: A Guide to the Collection, ed. 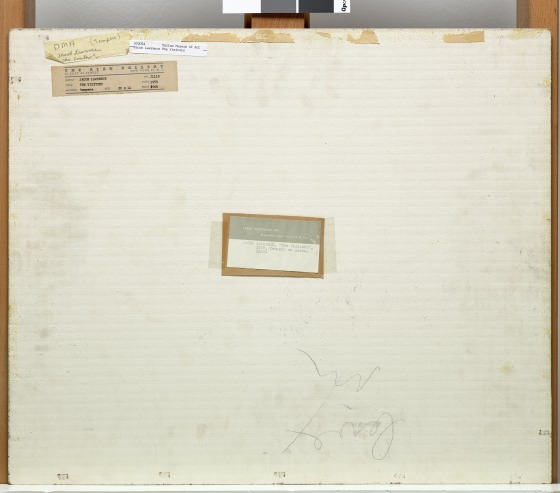 Suzanne Kotz (Dallas, TX: Dallas Museum of Art, 1997), 261. 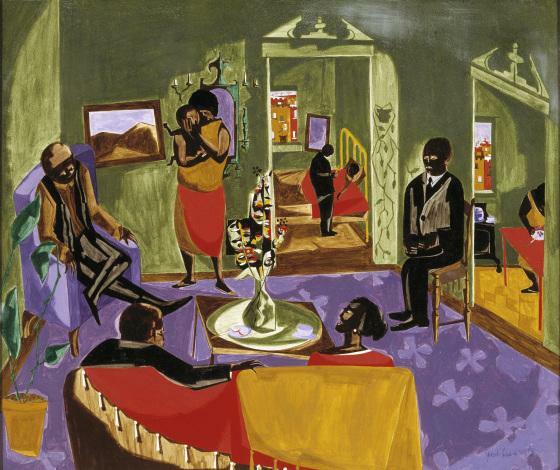 At 24 years old, Jacob Lawrence was the first African American artist to be represented by a major gallery in New York. 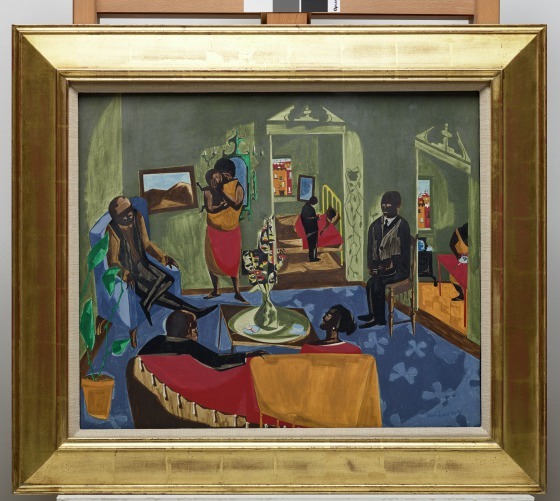 Learn more about the artist from the Smithsonian American Art Museum, Washington, D.C.
Watch this video from LACMA about Jacob Lawrence and his work. 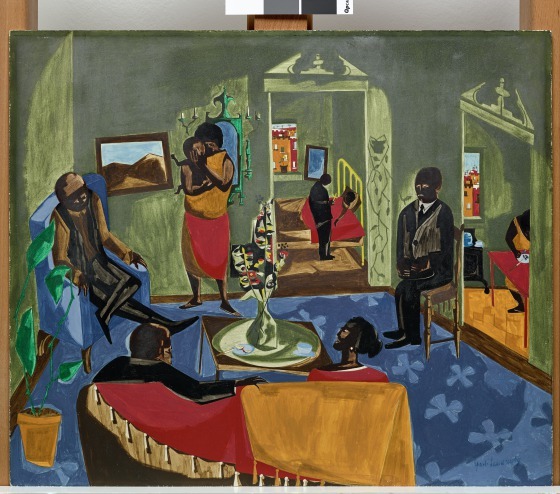 Read about the Harlem Renaissance of the 1920s which had a profound impact on the work of Jacob Lawrence.